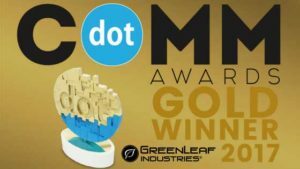 Recently EVH client, GreenLeaf Industries was awarded with a Gold dotCOMM Award in the category of Website, and subcategory of Manufacturing. GreenLeaf Industries is a custom plastic injection molding company located in Lenoir City, TN, who partners with MarketCrest, LLC to manage their website, marketing, and SEO. EVH Marketing works with the amazing team over at MarketCrest as Group Creative Director, designing logos, branding materials, search engine optimization and building websites. This website for GreenLeaf Industries was one EVH Marketing took the lead on back in 2015 when we built them a brand new website to go along with new branding and a new emphasis on corporate marketing and PR. In the last year, because of the rebranding, on-going website development, and content creation GreenLeaf Industries has seen a continuous increase in online interest in their company. They were even interviewed by Fox Business News in a segment about American manufacturing and a surge in re-shoring. To tell this story of successful marketing, MarketCrest created a case study outlining the work we completed to help GreenLeaf Industries reach their goals and submitted it to the dotCOMM Awards. We are ecstatic to see the GreenLeaf website chosen as one of the winners chosen from the pool of over 200,000 entries from 80+ different countries.